Grant and his wife Amy moved to Bend in July of 2006 and he began his career in property management before becoming a real estate broker. 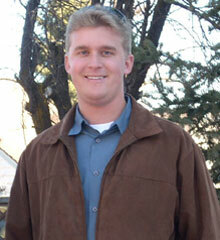 Born and raised in Santa Barbara, CA, Grant attended Seattle Pacific University where he graduated in 2006. During college, Grant studied philosophy and journalism in order to diversify his educational base while preparing for a career in real estate. Grant and Amy were drawn to Central Oregon by much of the same activities and opportunities that draw so many people in from out of the area. The seasonal environment provides Central Oregonians with almost endless recreational activities and a lifestyle that can adapt to fit the region’s distinct seasons. Grant enjoys playing golf and tennis, but he also takes advantage of every opportunity to explore the Cascade Mountains; whether it be hiking, biking, fishing, or skiing. Grant is excited to plant his roots in Central Oregon and he looks forward to working with those who want to do the same. Whether it is a first time home buyer, a weekend visitor, or an investor looking to take advantage of one of America’s best natural playgrounds, this region will be defined by the people who inhabit it and Grant is eager to help facilitate Central Oregon’s positive growth. Please give me a call at 541-633-0255.